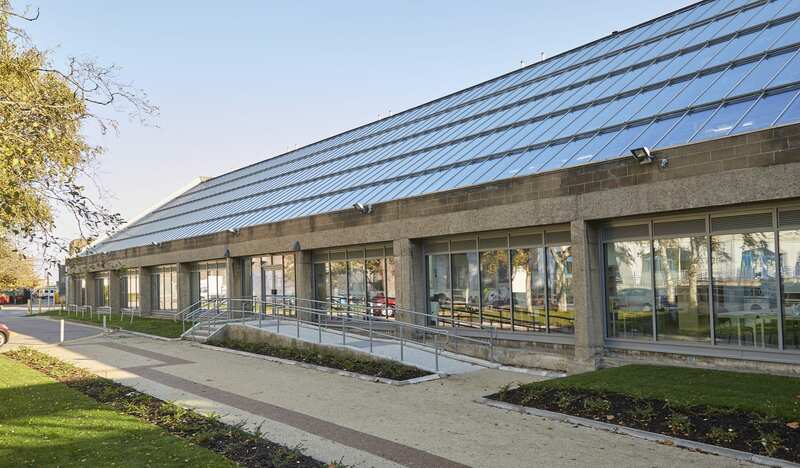 Designed by Seven Architecture, the sensitive refurbishment of the 1970s block has incorporated re-roofing, re-glazing, internal upgrades, plus a series of hard and soft landscaping works to improve the public realm and enhance routes around the campus. This £3million scheme is part of the College’s ambitious re-building plan to help to secure the future of the estate and for learners to have the best possible student experience. Energy improvements due to the thermal efficiencies of the new roof and windows will also assist in reducing operational costs for the College moving forward. The refurbishment works, which were carried out by main contractor Sewell Construction, were carefully programmed over the 20-week construction duration to minimise disruption to the students. The School is located partly within the Old Town Conservation Area with the ‘North Walls’ footpath running adjacent to the building which forms the line along which the 14th century fortification walls ran. This route has now become a key pedestrian link between the city centre, the Queens Gardens campus and the river side. Simon Parker, director at Seven Architecture stated, “By upgrading the elevations and landscaping we’ve been able to create an attractive frontage to the School which now makes a positive contribution to the surrounding context and the character of the Conservation Area. Forming a logical approach to the internal layout has also made full use of the building’s assets and now offers greater flexibility for the College”. The Hull College Group is one of the largest further and higher education colleges in the country, offering over 1,000 courses to over 26,000 students every year.